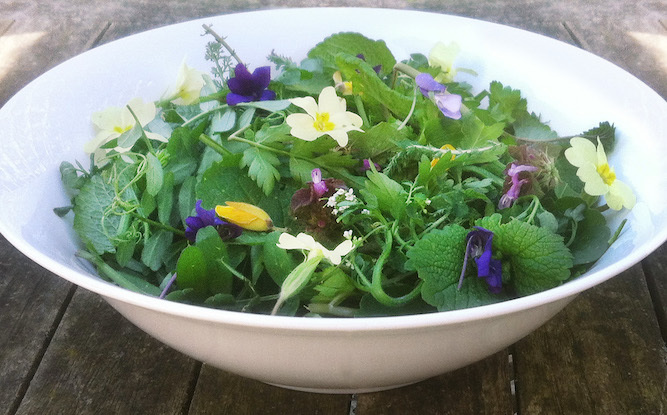 Wild food foraging is a wonderfully relaxing and enjoyable way to connect to the natural world. As well as slowing you down, it brings you into contact with the land, wildlife, the elements and the seasons…and it leaves no carbon footprint! The English countryside is jam-packed full of tasty, highly nutritious food which is safe for us to eat. Although it is possible to forage all year round, the spring and autumn are particularly abundant times. During the winter, our hunter gatherer ancestors would have lived primarily on meat, fish and roots. In the spring they would have added to this all the tasty young shoots, leaves and flowers to their diet – Many of which are naturally cleansing and detoxifying for the body. As spring moves into summer, some of the plants tend to grow a little tougher, but they still remain edible and delicious in soups, stir fries and stews. Late summer/autumn becomes the Harvest time when the trees and bushes become laden with their bountiful load of fruit, berries and nuts. On my wild food foraging walks I will teach you how and what to pick, in a way that is respectful to the environment and local wildlife. You will then learn how to incorporate these wild goodies, adding beauty and nutrition into your everyday diet.